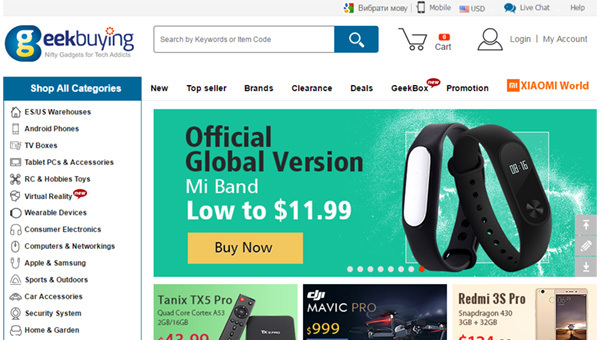 GeekBuying - is one of the Chinese internet-shops with a free-delivery service all over the world that offers you a lot of different products. A wide assortment of items and low prices - those are two keys to success that are used by this Chinese online shop. Its main assortment is Chinese electronics - smartphones, tablets, gadgets, household appliances, car accessories and others. There is a link on the homepage to a special page – Promotion. It is a sales section where you can actually find some very cheap products. Every day it has certain limited sales of concrete lots. If you register and subscribe for notices sending on your e-mail you will receive many different offers, like discounts and bonuses. The shop has a quality testing department. Moreover, the internet-shop gives you a one-year guarantee on almost all products. If the item is delivered defective, or it is inoperable initially you need to contact the support service. You will have to name the number of the order and the description of the items damage. After that, the support service gives you certain instructions. Usually in a situation like that you have to send back the item on your own budget. After the product is received the shop sends you an exchanged item for free. The payment is made by Visa and Master Card credit cards as well as by the PayPal payment system. The international airmail delivery is free. It is important to know that free delivery has certain weight and volume limits. Due to that, you can find out if the delivery is available for free after you place an item in the basket. You can also choose an express delivery (EMS, TNT, DHL) for additional payment. Delivery time was 6 - 8 weeks and often goods did not arrive. Although Geek often replaces items that did not arrive, it takes another 6 - 8 weeks. There is therefore no point in using them. Why buy something only to find out two months later that its not coming. There is no option for speed post or priority mail.